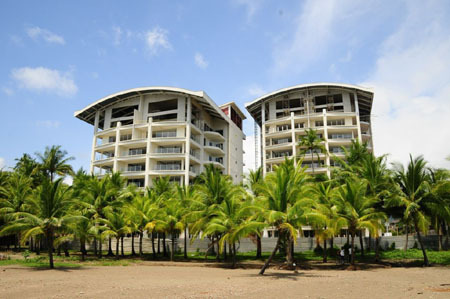 Diamante del Sol is an impressive two-phase development that offers innovative living in the heart of downtown Jaco Beach, Costa Rica with 1, 2, 3 and 4-bedroom condo suites. The first two towers of phase I (50 units) are absolute beachfront, affording spectacular ocean views from heights of up to 10 stories. Phase II (118 units) will feature a gorgeous central structure complete with commercial center, condos and rooftop swimming pools. Sales have recently been released in Diamante del Sol Phase II. A world-class day spa, fitness center, several gourmet restaurants, a multi-purpose theatre and possibly a casino are expected as commercial center occupants. Resort-style living includes staffed security, housekeeping and onsite management. Phase I of Diamante del Sol is currently under construction. Please contact us for ownership opportunities.